When we look at how spacious the interiors of crossovers generally are, it's easy to understand why they're so incredibly popular with buyers these days. That family friendly passenger and cargo capacity only improves further with bigger crossovers, which is why a model like the Ford Explorer is such a great option for families. Of course, the Ford isn't the fish in the sea, so let's see how it measures up in a Ford vs Toyota head-to-head by doing a 2017 Ford Explorer vs 2017 Toyota Highlander comparison. Clean edges, sharp corners, and lots of available textures on the grille and cladding help to make the 2017 Ford Explorer a thoroughly modern-looking full-size crossover. It's rugged enough without being too macho, so it really is a design that can appeal to an extremely wide audience. There's a definite sporty element to its exterior styling, which is only enhanced further by this year's introduction of a sport appearance package for lower trims. Today's Toyota Highlander is an improvement over its predecessors as it's done away with the horribly old-fashioned shape for something altogether more sleek and contemporary. There's still something a little awkward about the Toyota signature fascia though, so first blood in our Explorer vs Highlander goes to the Ford. Most of the bases are covered by the three powerplants found in the current Ford Explorer. However, beyond a lower price it's hard to see the point of the standard 3.5-liter V-6 these days as the more modern and fuel-efficient 2.4-liter inline-four produces almost the same amount of power. But if more power is your thing though, there's always the sensational 3.5-liter twin-turbo EcoBoost V-6 with its 365 horsepower. Toyota has decided to stick with two engines in the 2017 Highlander, which are a revamped version of its enduring 3.5-liter V-6 that now produces 295 horsepower and a four-cylinder. That's simply not good enough in this company though, so this is another victory for the Explorer. Some people may bemoan a lack of some of today's most advanced safety technology in the Explorer, but other than that you'll find all the features and equipment you could wish for in the current lineup. Standard kit includes the likes of: power windows, mirrors, and locks; Bluetooth; cruise control; cloth upholstery; numerous steering-wheel controls and AM/FM/CD stereo with a 4.2-inch display, and it just gets better from there as you go up the trims. There's a similar array of standard features and equipment in the Highlander, but Toyota does charge quite a premium to add some of the more desirable options to lower trims so we have to give the Explorer the victory here too. For a three-row full-size crossover, the Ford Explorer can be pretty good on gas as long as you go for one specific powertrain configuration. That configuration is obviously the 2.3-liter inline-four, which gets EPA-estimated ratings as good as 19 mpg in the city, 27 mpg on the highway and 22 mpg combined. The Highlander is considerably heavier than the Ford, so its V-6 engine is more frugal then the four-cylinder as the smaller engine has to work hard to move that bulk. But as the ratings are almost identical to the best the Ford can offer and adding all-wheel drive doesn’t hurt those ratings in the same way it does with the Ford, we'll have to give this round to the Highlander. Toyota has done a good job of increasingly the desirability of the Highlander, and it's an awful lot more attractive than it used to be, that's for sure. But the Ford Explorer really doesn’t have a weak point to speak of, and it's great to see little improvements such as the inline-four versions now able to tow as much as 3,000 pounds instead of 2,000 pounds as used to be the case. You will have to pay a little more for an entry level Explorer than for a base Highlander, but it's definitely worth it as the Ford is our winner here. 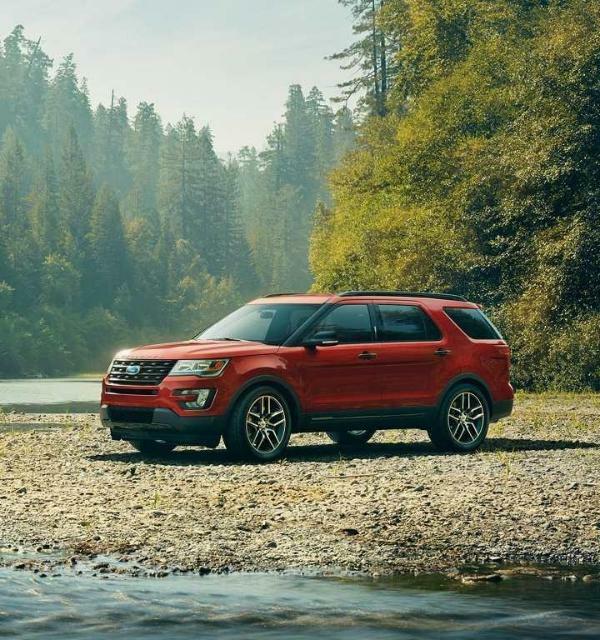 For more information about the 2017 Ford Explorer and to schedule a test drive in this sensational full-size crossover, don’t hesitate to get in touch with Southern California Ford Dealers today.